Showcase Cinemas is bringing Halloween fun to the theater this Halloween! 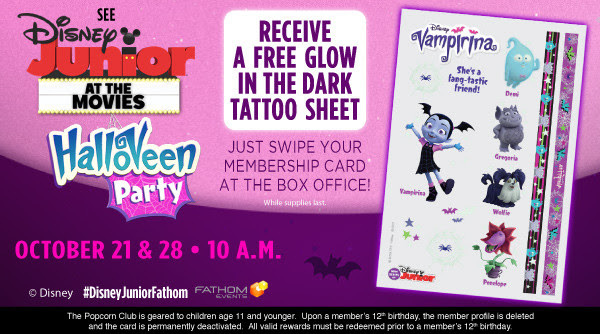 “Disney Junior at the Movies – HalloVeen Party!” comes to movie theaters nationwide for a special, interactive Halloween party this fall. Playing three days only on October 21, 26 and 28, kids and parents are invited to come in costume, get up and sing, dance, play and celebrate the most spooktacular time of the year with fan-favorite Disney Junior characters. 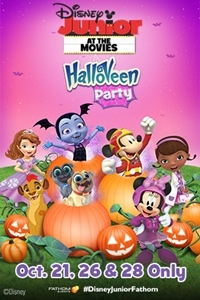 This one-of-a-kind event includes an all-new episode of Vampirina, featuring the voices of Lauren Graham, James Van Der Beek, Isabella Crovetti, Patti LuPone, Brian Stokes Mitchell and Wanda Sykes, as well as episodes of Mickey and the Roadster Racers, and Halloween-themed music videos and interactive games. The Popcorn Club is a fun and exciting club for kids and families at select Showcase Cinema de Lux, Showcase Cinemas and Multiplex Cinemas. FREE 1-2-3 Go Box (includes popcorn, soft drink or ICEE, and special size candy) valid at all participating theatres. FREE movie ticket on your Birthday valid at all participating theatres. Popcorn Club members receive special offers, invitations to exclusive family events and advanced movie screenings, and other great prizes.